The end of the year is only a few days away, but there’s still plenty of time to make your last minute car donation! If you planned on making a car donation this year but never got around to it, now is your chance to get that crossed off your list. Doing anything last-minute can be stressful, but it’s easy to donate your car at any time. We accept car donations over the phone at 1-877-431-9474 and through our online car donation form. When you’re ready to donate, just get in touch with us and we’ll take care of everything. Our call center is here to help with any questions you may have about donating your vehicle to charity, so don’t hesitate to ask if you need help! We are here to take your donation all the way up to the last minute of 2017! If you do miss the deadline for a 2017 car donation, you can still donate your car in 2017 for a tax deduction on next year’s taxes. Plus you’ll feel great knowing you crossed a big thing off your list so early in the year. Do I Still Get A Tax Deduction For This Year? Yes, any donation we receive by 11:59 on Dec. 31 count for the 2017 tax year. As long as we hear from you before that time, it counts. Even if your car is picked up in 2017, your tax deduction applies to this year’s taxes when you make the deadline for 2017 car donations. Even if your tax deduction receipt arrives in the New Year, it still counts! Wheels For Wishes accepts a wide variety of vehicles including cars, boats, RVs, campers, ATVs, trailers and more. In most cases, your vehicle doesn’t even need to run in order for us to accept it as a donation. If you’ve been holding onto a car you never got around to working on, or an RV or boat that’s hogging all the space in your shed, eliminate the stress of holding onto it by donating instead! When you go with Wheels For Wishes, you don’t even need to worry about making repairs on your car before you donate it. In most cases, we can accept vehicles in any condition! The end of the year is almost here. 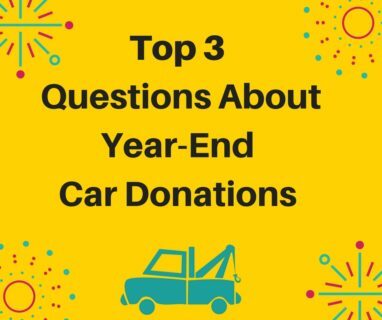 In 3 easy steps, you can donate your car today! Start by giving us a call at 1-877-431-9474 or filling out our online donation form. Once that is done, you will receive a call within 24 hours to schedule your FREE vehicle pickup. Lastly, you will receive your tax deductible receipt in the mail!